We were so excited to see a new restaurant coming to the Northgate area. Hamilton Place seems to be the location of choice for restaurants. Hopefully, this is the start of more restaurants to come. We arrived at around 5:15 on a Saturday evening, and we had about a five minute wait before we were seated. There was plenty of beer on tap, I had a Big River IPA and Mr. Grey had a Chattanooga Brewing Company Imperial Pilsner. My IPA was wonderful (I love a good, hoppy IPA), I thought the pilsner was just so-so. We both decided to go with a salad. 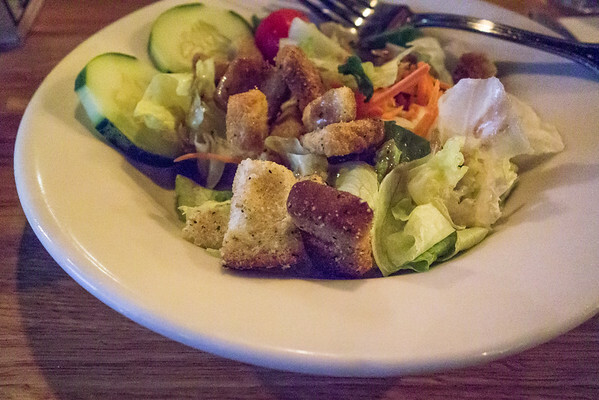 It had a good blend of lettuce, cucumbers, tomatoes, carrots and croutons. For the entree we chose the 14 inch tavern thin Meat Me pizza for $23.50. 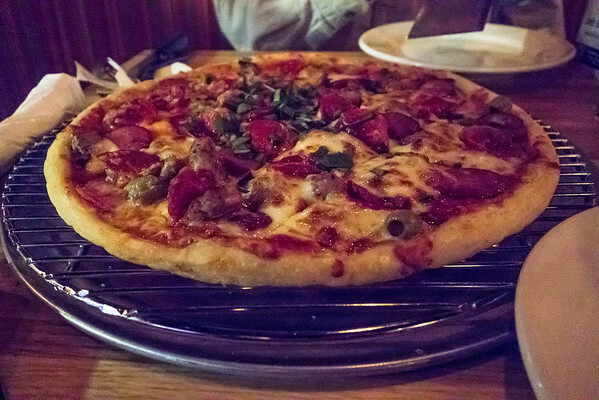 The pizza had Italian sausage, Canadian bacon, andouille sausage, pepperoni, green olive garnish and fresh basil. There was plenty of meat and cheese and the fresh basil was a nice touch, though it was mainly thrown on the center of the pizza instead of sprinkled over the whole pizza. The one thing that kept our evening from being completely enjoyable was our table. We were seated at one of little two top tables that are squeezed in a long line. One side is a communal bench and the other side has a chair. The tables are barely a foot apart so that people have to turn sideways to scoot in to get to their bench seat. These tables are not very comfortable to begin with, but for a pizza place, they are ridiculous! You can see from the above photo, that our dishes had to be scooted practically off the table. We had the choice of having our pizza hanging off the table or our dishes. It was cramped and uncomfortable and did not make us want to linger (perhaps their point). We gazed longingly at the people sitting at regular tables and in the booths. If we go there again, we will definitely ask for a booth, even if it means waiting longer. Overall it was a good experience (except for the table), the pizza was good, our waitress was very friendly and attentive. 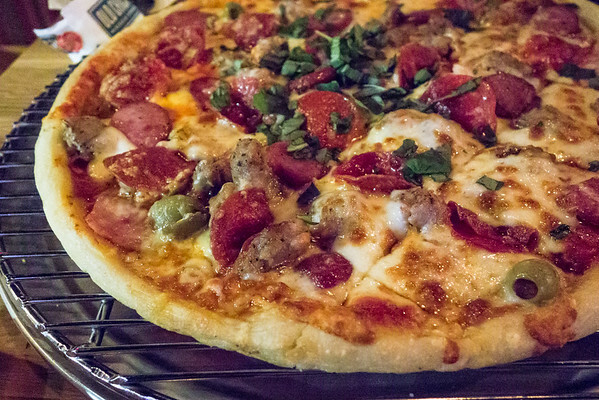 Their website: Old Chicago Pizza at Northgate. Hi there! I just discovered your blog, while looking for reviews for Rons’s Pig Out. I am super excited to discover we share the same interests, great food, travel, photography, shopping. You got yourself a stalker. I will be checking out all your blogs and look forward to reading more reviews of restaurants in Chattanooga. I have just tried this new pizza place last weekend and I enjoyed their Chicago-style dough.